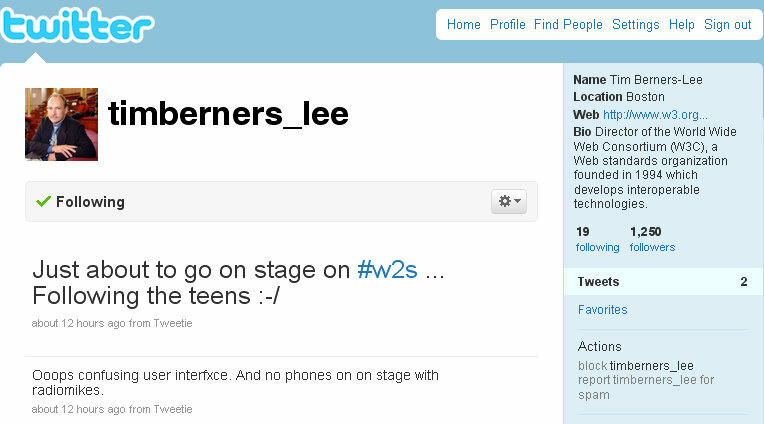 Approximately 12 hours ago, Tim Berners-Lee joined Twitter. Who’s that, you say? Oh… noone really, he’s just the guy who invented the world wide web (the Internet as we know it). So he joined Twitter around 1 am EST, sent out only 2 tweets, both of which were from tweetie, a popular iPhone app for sending out tweets, and he now has 1250 followers (and counting). 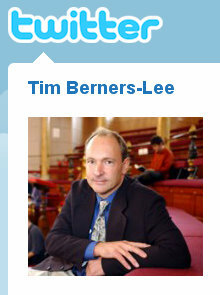 Tim Berners-Lee is a graduate of Oxford University, England, in 1989. He invented the World Wide Web, an internet-based hypermedia initiative for global information sharing while at CERN, the European Particle Physics Laboratory.